Andrew Oldcorn reckons he has to find a way of feeling relaxed while keeping focused at the same time if the Edinburgh man is to emerge as the local hero in East Lothian this weekend. The 56-year-old sets out at Archerfield Links on Friday aiming to join David Huish, Bill Longmuir and Sam Torrance as home winners of the £250,000 Prostate Cancer UK Scottish Senior Open. Oldcorn’s best finish in six previous appearances in the event is 18th at Fairmont St Andrews in 2012 while he just scraped inside the top 40 on its first visit to Archerfield Links 12 months ago. But, having recently ended a five-year drought with victory in Germany, the Kings Acre Academy-attached player is the leading home hope this time around heading into the 54-hole event on the Fidra Links. “Whenever you play in a home open, or in tournaments that are branded as your national event, people maybe expect a little more of you,” admitted Oldcorn, who has managed just once in 18 rounds to break 70 in this event to date. “The win a few weeks ago helps me mentally and takes a little bit of the pressure off me. I can take care of business and do the best I can, rather than force things. I need to remember to relax and get on with it. Sitting seventh on the European Senior Tour Order of Merit, Oldcorn is on course to record his fifth top-10 finish on the money-list in seven seasons, his best having been third in 2011. “We have a good run of tournaments over the next few weeks, finishing in Paris on the Ryder Cup course, which is one of my favourite courses in the world, never mind Europe. It’s important to build momentum,” added Oldcorn. His win in Germany came in a play-off against Paul Broadhurst, who has since won the Senior Open Championship and is the defending champion this week after the Englishman made a winning debut here in the over-50s ranks a year ago. 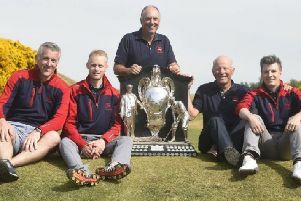 “It’s a wonderful golf course, all the guys really like it here,” said Oldcorn of the DJ Russell-designed Fidra Links that also staged its first European Tour event - the Paul Lawrie Match Play - a fortnight ago. “It’s in as good a condition as I’ve ever seen it. Steve Cram (course manager) has been here just over a year. He’s a great greenkeeper and has very high standards. “It’s so beautiful out there, too. The first 11 holes are played through pine trees and then you’re out in links country. While Broadhurst has secured an exemption for the money-spinning Champions Tour in the US on the back of his major win at Carnoustie last month, the 51-year-old insisted a title defence on the East Lothian coast was always on the cards. The former Ryder Cup player only arrived back from the US Senior Open earlier in the week and heads across the Atlantic again next Tuesday for the first of up to nine events between now and the end of the year on the Champions Tour. “Yes,” he replied to being asked if his life had changed over the past few weeks. “It’s a British Open, isn’t it? Things like that don’t happen to me. I have to get used to it. I have to get used to the expectations and what it means. One of Broadhurst’s main challengers this weekend could be former Masters champion Ian Woosnam, who knows the Fidra Links well from having staged an annual charity event at Archerfield Links. The little Welshman also handed himself a timely boost for this event by finishing fourth behind American Gene Sauers in the aforementioned US Senior Open in Ohio. Torrance, the 2006 champion, and Longmuir, who lifted the title two years earlier, join Oldcorn in a home contingent while the field also includes two players attached to the neighbouring Renaissance Club - Ronan Rafferty and Stephen McAllister.